The logarithmic scale is a non-linear measurement scale that uses logarithms of a number to certain bases (commonly base 10). Each number on the scale is obtained by multiplying the previous number by a power. If the base is 2, the scale is 2, 4, 8, 16, 32, 64, 128, and so on. If the base is 10, the scales are 10, 100, 1000, 10000, 100000. Unlike the linear scale where tick marks are equidistant, the logarithmic scale uses tick marks that differ by powers on the base. 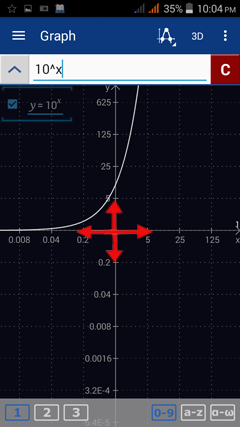 To set the x-axis to a logarithmic scale, tap the menu button and go to: Settings > Graph > X-axis scale type > Logarithmic. The option will change the x-axis scale into powers of 10. 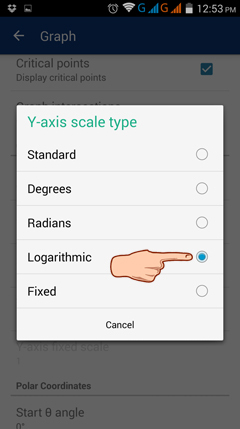 To set the y-axis to a logarithmic scale, tap Y-axis scale type > Logarithmic. The y-axis scale is now set to powers of 10. To use other powers as scales, tap the Graph window and pinch or stretch until the desired scales are displayed.